Learning to ski is a gift. Kids can start as young as 2 years old—a perfect age to learn because they are not only fearless but also close to the ground. By learning to ski at such a young age, these kids will have the gift of knowing how to ski for their whole life. My husband and I never learned to ski but always wished we had. 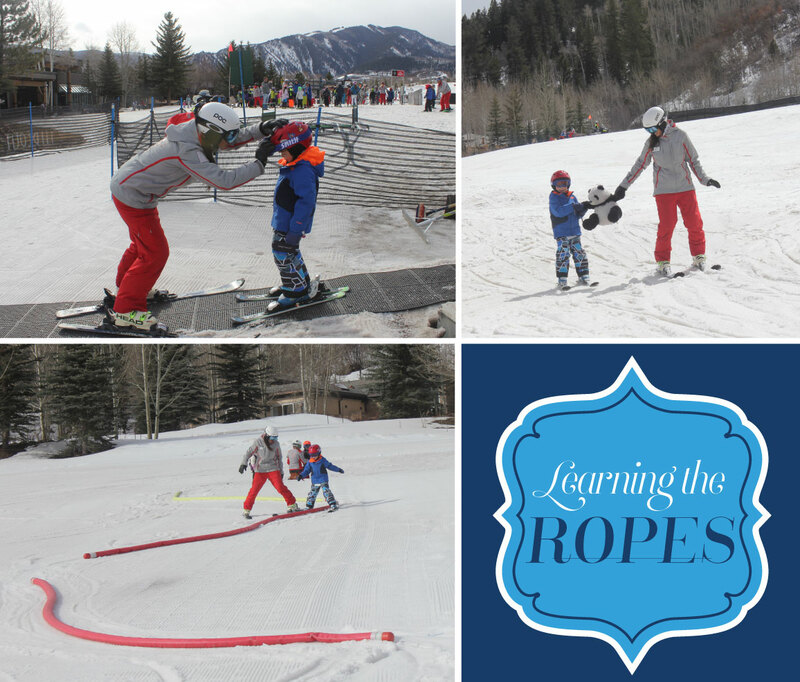 That’s why last winter, I decided it was time to give my 5-year-old son Harry the gift of learning how to ski. I did my research and enrolled him at one of the best ski schools in the world, Aspen Snowmass Buttermilk Ski School. I liked that the lessons at Buttermilk Ski School were focused on small children. As a non-skier, I had no idea how to prepare Harry for a few days of classes, so before heading to Aspen, I called the experts at Buttermilk Ski School. We spoke at length, and I asked millions of questions so that I could understand everything that I needed to do to prepare my little Harry for a successful ski school experience. Everyone I spoke to on the phone from Buttermilk was excellent, and because of their assistance preparing me to prepare my son, we had an amazing experience with ski school. I’ve outlined the tips below in hopes that other parents like me who don’t ski will have the courage to put their kids on skis and give them the gift of learning to ski. Harry absolutely loved Buttermilk ski school and cannot wait to start skiing again this season. 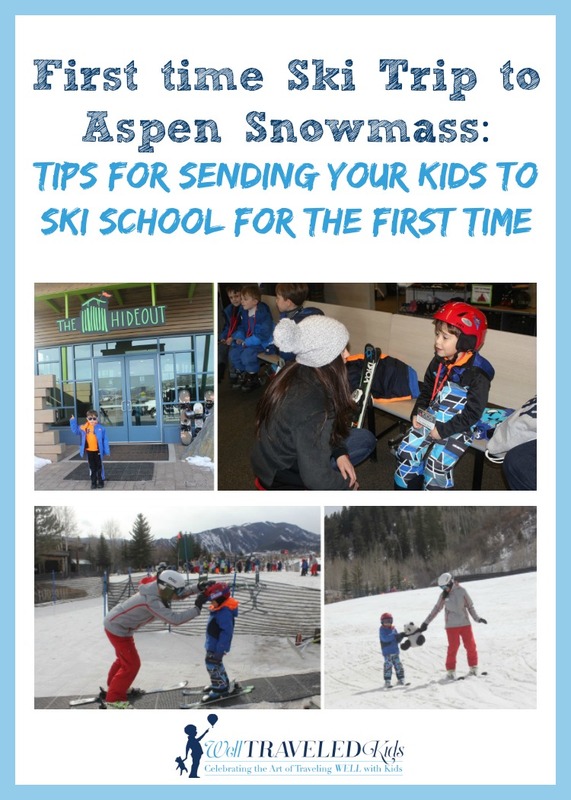 While some tips are specific to our experience at the Aspen Snowmass ski lessons program on Buttermilk Mountain, I’m sure they would be similar anywhere that you find a great ski school for kids. Preparing for a successful ski school experience is very important to make sure everyone has fun. Pack the essentials—Be sure to pack a bag for your child that includes sunscreen, Chapstick, Kleenex, a water bottle, and any inhalers or other medications necessary for the day. Dress your kid for success in moisture-wicking layers—Apply sunscreen to the face but not too close to the eyes. When your kids sweats, you don’t want the sunscreen to burn her eyes. You’ll also want to dress your kid in layers—and avoid cotton. Instead, choose moisture-wicking fabrics. Start with a light top, add a mid-weight top, a sweater, and a ski jacket. Make sure she has good ski socks (also not cotton) and long underwear pants below track pants and snow pants so that as the day goes on and your kid strips off layers, she is still dressed for a great day on the slopes. Kids grow so fast! You don’t have to buy everything; you can rent it—We rented Harry’s waterproof ski pants, ski jacket, goggles, and ski gloves from KitLender.com. It was perfect. Harry loved looking like a pro in his ski outfit, and I loved that we had him dressed in all the right gear for the ski trip without investing hundreds of dollars on clothes that wouldn’t fit next season. Kitlender.com was an awesome service that shiped everything to our home so Harry had the exact sizes he needed, and at the end of the trip I simply shipped it all back. Be sure your kids eat a big breakfast and hydrate in the morning before ski school—This is very important. Elevation sickness is a real thing. Everybody should drink lots of water and have a nutritious breakfast with some protein and fruit to keep the little bodies going and feeling good on the slopes till lunchtime. We hit the breakfast buffet at our hotel the St. Regis Aspen to grab a quick nutritious bite each day before heading to ski school. Also, give yourself and your kids a day or so after arrival in the mountains to acclimate to the high elevation before hitting the slopes. Arrive 45 minutes early to give yourself time to sign all the liability waivers and your child time to see the facility and meet the ski instructors. The ski school at Buttermilk provides little ones with boots, skis, lunch, and all the additional equipment that the kids will need for skiing on the slopes. Everything is included in the price of ski school for the day, so there’s no need to rent that stuff when you’re renting coat and pants. Be prepared to drop your kids off and then find ways to entertain yourself for the day while they ski. There are many restrictions to protect the children at Buttermilk Ski School, which means parents may not take photos of group lessons or stick around to watch the kids for safety reasons. Consider private lessons if you’d like to arrange to take photos or go out on the slopes with your child. No non-skiers are allowed on the Panda Peak chairlift. So, once your kid gets good, you may want to splurge on the private lesson so that they can go up the chairlift with their ski instructor and continue to progress into an even better skier. Group lessons versus private lessons is the biggest decision you will need to make. The group lessons are divided by ages (2 years old up to 12 years old) and run from 9:30 a.m. to 3 p.m. daily. The private lessons can be booked for full- or half-day availability. Only during private lessons are kids allowed to take the panda ski lift when they are one-on-one with the instructor. Also, in a private lessons, parents can snap pictures of kids taking the lift up to ski down the mountain. For us, I knew Harry would enjoy learning to ski with other kids his age, so we did ski school for the first day. He was in a group with other five- and six-year-olds and had a blast. The second day, we tried a private lesson. This was an awesome way to do it because he had become confident and learned enough skills the first day that by the second day, the private instructor was able to really make progress with him. By the end of his private lesson, he was skiing down Panda Peak and loved riding the chairlift back up each time. Because it was a private lesson, my husband and I were able to go out and take photos of his ski lessons, which I will never forget. Harry fell in love with skiing and his super fun instructor Danisa by the end of their private lesson day. Come with cash for tipping your pro—One of the biggest questions I had was how much to tip the ski pros who worked so well with Harry. I asked the staff at Buttermilk and was told that at Aspen Snowmass, tips are always appreciated but not expected. Harry loved his instructors, and I absolutely wanted to tip them. I was also told that the going tip rate is typically between 10 and 20 percent. I was so impressed with the children’s instructors that it was my pleasure to tip them each 20 percent after watching them take my kid—who had never been on skis before—and turn him into a skier within two sessions. Pack snacks and dry clothes when you go to pick up your kid—Harry was tired, hungry, hot, and sweaty each day when I picked him up. He was ready to change into dry comfy clothes and devour a snack with some water right away. Après Ski- After a day at ski school, your kid is going to be pooped for sure. But leave time for him to play at The Hideout in the kids play areas for a few minutes before you leave. Then, head to your hotel room or into town for an awesome Après Ski experience. We had two favorite family spots for Après ski. We loved stopping at our hotel, the St. Regis, for an Après experience that included hot chocolate, s’mores, and cocktails for the adults all around the fireplace. We also headed over to the Limelight in Aspen for a family friendly Après Ski experience complete with delicious food and drink specials. This is the best part of the day—when your kids relax and share the delightful stories of a day on the slopes. Don’t hesitate to call and ask your own questions before you enroll your kids—Still not sure if your kids are ready? Don’t hesitate to call the ski school that you’re considering and ask to talk to a pro. When I called The Hideout at Buttermilk Mountain, I was impressed with how very friendly and informative the team was. They gave me the confidence as a non-skier to make sure my son’s ski experience was awesome. Thanks to Aspen Snowmass for an amazing experience. You were so great to offer us the two complimentary ski school days for Harry for purposes of this review! We will never forget what an amazing experience it was. As always, all opinions are my own. Planning on taking your kids skiing for the first time this year? Pin this for later!